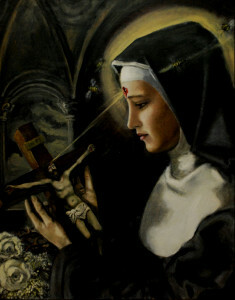 Rita is regarded as a patron of those suffering violence and abuse in marriage. 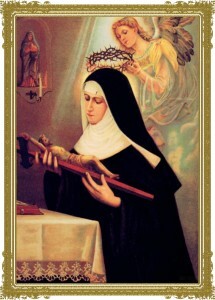 Summary of St Rita of Cascia who was born in 1381 at Rocca Porena (Italy); died on this day in 1457 at Cascia. Obedient to the will of elderly parents, she accepted an abusive husband and remained faithful for eighteen years until his violent death. When her two sons died soon after, she became an Augustinian nun. She was noted for her life of penance and her suffering. Married at twelve, Rita endured eighteen years of a violent marriage. After her husband’s death, despite an initial refusal, she succeeded miraculously in entering the Augustinian convent where she spent the next forty years. Patrick Duffy tells her story. Born at Roccaporena, near Spoleto, in Umbria, Italy, Rita wished in childhood to become a nun, but out of respect for her parents wishes she married Paolo Mancini, a quick-tempered man with many enemies, who was notoriously violent and unfaithful. They had two sons. Rita endured insults and infidelity for eighteen years till one day Paolo was brought home dead after being murdered in a revenge-killing. His sons wanted to take further revenge, but they both died before they could do it. In 1407, Rita, then a widow, wanted to enter the Augustinian convent at Cascia, but the nuns refused, fearing her husba nd’s family and their rivals. Rita succeeded in reconciling with her husband’s family and their rivals, but the prioress still said no. However, Rita started a campaign of prayer which resulted in her miraculous entry. During the night, when the doors to the monastery were locked and the sisters were asleep, her patron saints Saint John the Baptist, Saint Augustine, and Saint Nicholas of Tolentino appeared to her and miraculously transported her inside the convent. When the nuns found her inside the convent in the morning and heard how she entered, they felt they could not turn her away. Rita remained there, living by the Augustinian Rule, and giving herself to intense meditation on the passion of Jesus until her death. After twenty-five years of religious life, a wound appeared on her forehead as if she had been pierced by a crown of thorns. This continued unhealed for fifteen years. Meanwhile Rita devoted herself to caring for sick nuns and counselling sinners. Rita’s last years found her confined to bed as an invalid and she died of tuberculosis in 1457. Her reputation for miracles and holiness led to her incorrupt body being translated to a tomb that survives till today. She was beatified in 1626 by Pope Urban VIII and canonised in 1900 by Pope Leo XIII. Probably because of her miraculous entry into the convent, her cult as the patron of the impossible flourishes widely today. She is also regarded as a patron of those suffering violence and abuse in marriage. 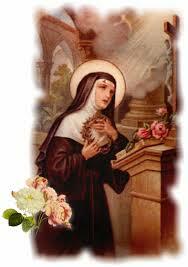 A special event at Roccaporena and Cascia is the blessing of roses on her feast day.